There's just something about the sailor collar that calls to me. 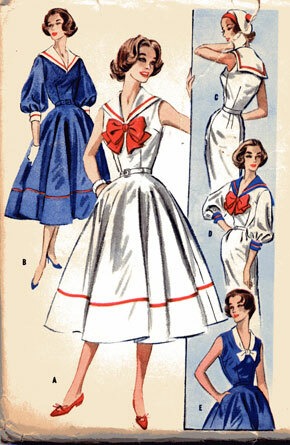 I have bought probably a dozen sailor-collar patterns, everything from full-skirted stuff like this to drop-waist 1960s scooter dresses to barely-justifiable 1980s padded-shoulder tops. I've bought sweaters with sailor collars, t-shirts with sailor collars, and in college, actual Navy surplus middy blouses in both heavy wool and that indestructible white polyester (with the insignia carefully removed, of course). When I make this one I'm not going to do those silly puffy belled sleeves; I'll make nice above-the-biceps short sleeves instead. And I'm really tempted to do black with white middy braid, instead of white and red or blue and white. And I probably won't wear a matching tam and gloves … but I'd be tempted. Do you notice how the one view without a sailor collar is illustrated by a woman with a wistful expression? That's how I'd feel, too, if everyone but me had a sailor collar! Another estate sale find, Erin? ;)I too love the sailor-collar look, but as it was interpreted in the 1930s and 1940s. Think Ginger Rogers in “Follow the Fleet.” I also have a couple of sailor-collar patterns in my collection, one is a copy from the 1930s, the other is a jumper-variety from the 1960s. I actually love this one just the way it is, silly bell sleeves and all, and would wear it with the full or the straight skirt, ad infinitum. It is fabulous. (You are eventually going to republish your favorites, in different sizes, so your fans can make their own, right, Erin? Right? Pretty please? )For your love of sailor collars, if you have not already gotten it:http://trulyvictorian.netfirms.com/90cat.html TV498 Eton JacketThis is a waist or bolero-length fitted jacket, with a sailor collar option. I have it, and it’s wonderful. Unlike many indie pattern companies, the folks at TV are not misanthropic psychopaths, and their patterns and directions make sense and work. HiI would really like to make or own a couple of lovely short sleeved or sleeveless sailor collar tops, to go with my 1940s wide legged jeans trousers. I am a size 38 bust does anyone know where i can get either a sewing pattern from or knows of anybody that makes these tops. My name is Tania email address is white_angel86@hotmail.co.uk. Thank You.